Northern Expressions Needlework: What's New and Exciting? Well, to be honest, not much of either really. Long story very short, It's been a very rough couple of months. Between illness, a death in the family, and Jon being laid off for two months, I just haven't been feeling very creative. It's frustrating, I have lots of ideas in my head, even sketched on paper, but as soon as I sit down at the computer they all seem to disappear. I just attribute it to being down in the dumps. I promised Jon that I would have fun with designing, so I'm trying very hard not to stress over it and just stitching what I want and when I feel like it. Plus, anything I design I have to have at least the fabric on hand for, since I'm too broke at the moment to buy fabric for models. lol You'd think with the enormous amount of stash I have, I'd be able to do that but alas, the three I currently have almost ready to start I either have the colour but not a big enough piece or don't have the right count for the type of project. I could substitute, but then the project isn't what I envisioned and I know I wouldn't be happy with it. So that's where the designing stands at the moment. 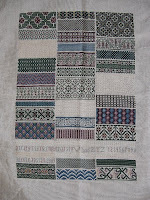 So what have I been stitching? Well I've had a few finishes. 1 big one, 1 pretty big one, and 2 small ones. The big one is Drawn Thread's Toccata 4. I loved this piece so much I just can't tell you how much fun it was, words don't express it. It was sheer joy from the first stitch to the last - well except maybe the boucle stitches, but once I got the hang of them, they weren't so bad. Just took lots of practice. 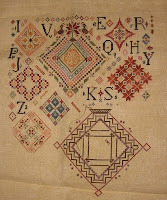 This is a wonderful piece for anyone wanting to learn new stitches, and is also a great piece for playing with colours. I used my own colourway, though I stuck close to the original colours I used things I had in my stash, but you could use almost anything you wanted! This did use a fair amount of floss, and if you're planning a start, make sure you have lots of the greens and creams! I used 34 ct fabric and went well above the recommended amounts. 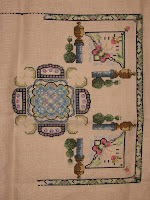 It's done in a combination of Soie D'Alger, Gloriana, Silk N' Colors and HDF on 34 ct Cafe Au Lait linen. Second, the pretty big one - I finished Ink Circles Cirques Des Carreaux. Dimension wise, it's not so big, as I stitched it over 1 on 28 ct, but there are a lot of little x's in this one, so it still qualifies as a pretty big one. lol This one started out as a test piece for one of my own designs, testing out Gloriana colours for Easter Flowers. 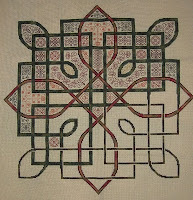 So yes, it's all stitched in Gloriana silk, on black Jobelan. I'm already plotting out my colours for Triangles, which I'm thinking I'll do the same way, but in ultra bright colours, again on black. This was a fun one, I do so enjoy over one stitching - though I've learned that 28 count is best for me, 32 and up I don't have as much fun with. And finally the two little ones - I had already finished Chilly, about 2 years ago, but I stitched up Milly and Willy over Christmas. These stitch up so quickly - about 2 days each. I actually used cotton for these... cause I already had them kitted. They're stitched on 28 ct Bluebell Jobelan over 2, primarily in Weeks Dye Works, and a few DMC colours, though I snuck in some HDF white on the last couple. :D The chart is called Snowman Trio, from Stitchy Kitty, and I just can't say how much I love these little guys. They're so cute!! Eventually they'll be finished up as ornaments or something - haven't decided what yet - and will be for my mom. She's a snowman addict. With all those finishes, who could resist a new (or a few new) start? As I said previously, I knew that when I had Quaker Diamonds in my hot little hands, I would have to start it... and I did. I changed my mind on colours so many times it was silly, and finally settled on using HDF for the whole thing. It's not exact to the model, which doesn't really bother me that much at all. I chose to use a fairly new series of colours that Vikki created, the "Be" series, plus a couple of other bits and pieces I had. If you're interested in my conversion, let me know and I'll post it. :) I ended up going with Sassy's French Vanilla in 40 ct for the project - it's a fantastic colour of fabric! 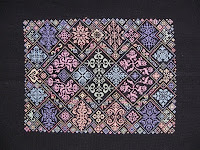 This is a nice project, and it looks fabulous stitched, but I'll give a warning to anyone planning to stitch it - there is a LOT of colour changing. One stitch here, one stitch there... and if you're like me, you like to stitch all of one colour in a section before moving to the next, which means a LOT of counting. And of course I also said I'd be starting Romantic Rose Garden, which I also did. I replaced the evil nasty DMC colours with Eterna for this one, and I'm using some of the recommended colours for the variegated. I found the SNC Forest and the Waterlilies Periwinkle just were too overpowering. So I'm using a Northern Lights Green for the Forest, and HDF Dark Wisteria for the Periwinkle. I'm still debating changing 2 of the DMC greens, the 472 and 581 - the 472 is neon bright against the others and the 581 is too olive - it really clashes up close. Though from a distance they all seem to fit together well so we'll see when I plug the rest in. I'm doing this one on 34 ct Cafe Au Lait from Legacy Linen. And of course, blogger strikes again and rotates my pics! And my last WIP, another Ink Circles, is Blackstone Fantasy Garden. I so wanted to start this over again in silk but so many people told me to stick with it, so I have. 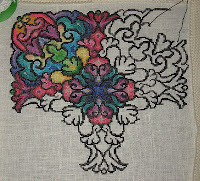 I'm almost finished all the cross stitch and have the last half of the blackwork to go. Now that I'm nearing the home stretch, I'm pleased with how it looks and I'll finish it, but it's been a labour of love getting this far. There ya go fudgey - I know I promised this yesterday, but I got sidetracked playing playstation and doing laundry. And now I have to run off to work. No idea yet when I'll have another day off, but I will try to update again when I do! You have a lot of lovely projects on the go. Like how Cirque des Carreaux turned out. I'm stitching that one as well only I'm picking out colors from my bedspread. Hope "the dumps" leave soon and that the fabric problem gets solved.